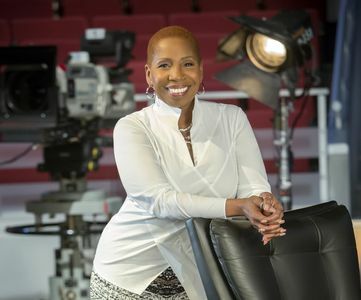 Iyanla Vanzant knows a thing or two about being broken. She lost her mother at age 3. She also lost her daughter to cancer, she lost her marriage to misunderstood words, she lost her home to bankruptcy, and she even lost her will to live in her darkest moment. But through all of this hardship, Vanzant has gained wisdom that she, thankfully, shares with the world. The author, speaker, teacher and adviser has spent decades as a relationship coach, and is more than prepared to help guests on her OWN TV show Iyanla, Fix My Life In this exclusive interview she talked about the show, learning lessons the hard way and healing with Oprah Winfrey. Vanzant described the show. "The basic premise is to teach people how to be people. We don't know how to do that. It's a lost art. We know how to be doctors, nurses, lawyers. We know how to be tweeters. We know how to be everything. But how you just be people? How do you be present with one another? How do you be honest with one another? How do you be compassionate towards one another, forgiving towards one another? We know what to do. We don't know what to be, how to be." Vanzant believes that this lack of knowledge leads to bad behavior and that's where she comes in, "I go in and look at what you, do how you do it, why you do it, and then support you in making better choices." But Vanzant said the title is somewhat misleading. She stated, "I don't go in with anything fixed... I step into your space with some understanding of the challenge, issue, problem. I share with you the truth as I feel it, sense it, see it, know it in that moment. And then provide you with other possibilities... The fixing comes as I offer you the information. You do the work. I don't do the work." Iyanla Vanzant learned these lessons on her own While Vanzant was teaching people about relationships, her own marriage was crumbling. And shortly after her daughter died, she was asked to help other women heal on the daytime reality series Starting Over. She recalled her biggest lesson from this period: "That you don't have to be perfect to make a powerful contribution." She continued: "At your worst point, the quickest way to move through it is to be a contribution as opposed to focusing on your problems. If you focus on your problems and keep giving them attention, they're going to grow. If you ignore them and do something else -- I don't mean act like they're not here -- but do something meaningful, it helps you work through it." Vanzant also worked through another breakdown publicly. After years of being Oprah Winfrey's relationship guru, the two had a falling out due to a misunderstanding over whether Vanzant was ready to have her own talk show. She felt ready. Oprah disagreed. However the problem did not lie in the difference of opinion but in the lack of communication about it. After an 11-year separation, Oprah and Vanzant reunited. "She called me to come on and talk about the book and the healing occurred organically," Vanzant recalled. "She and I did not plan to have that conversation on national television. That wasn't the plan. But when I got the call, I knew that it was a healing moment." But she didn't understand how widespread the mending would be. "I didn't know we were healing the world and being a demonstration to the world about how to have a conversation to heal a breakdown in a relationship, because that's what it was. It wasn't about me and Oprah. It was about two people who care about and respect each other universally, who love each other, being willing to have the hard conversation to heal a break down. I'm glad we did it, and it was good because look at the results." To learn more about Iyanla, Fix My Life visit the show’s official website.